Long Story Short: U.S. Capitol Police Officer John Cale (Channing Tatum) is tired of disappointing his daughter (Joey King) tries to impress her by applying for a job in the White House working with the Secret Service. He takes Emily with him to get a tour after his job interview. But suddenly the White House gets attacked by terrorists. Review: Due to many bad reviews I was almost not looking forward to seeing this movie, however, once it started I knew I was going to enjoy it. From the very beginning it is obvious that this is going to be a stylish action-thriller that has two very popular actors in the leading roles, that’s it! If anybody expects an Oscar- worthy movie he must be very naive, because the title alone tells you that there isn’t any mind- challenging storyline to expect, or am I wrong? 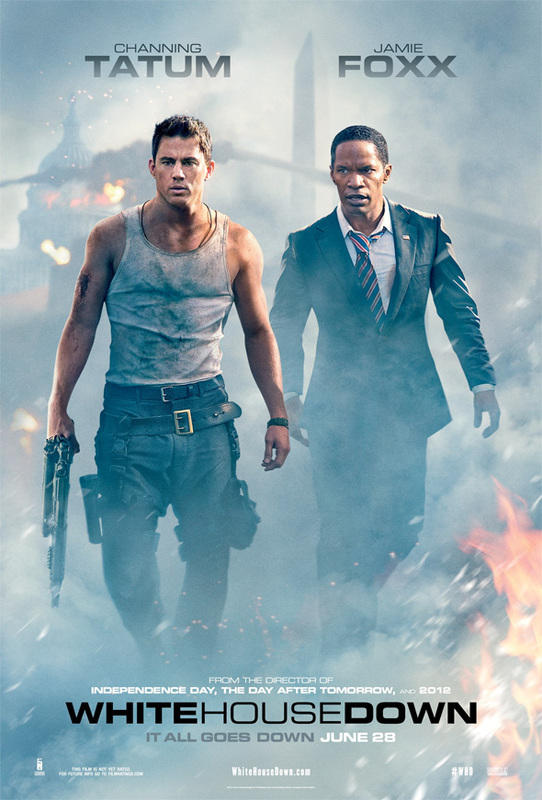 Channing Tatum and Jamie Foxx are a great team and the fact that they aren’t bad looking helps this movie a lot, too. I was surprised at Tatum, because this is actually the first time I didn’t need any subtitles to understand him, which made me very happy. Like I have said in my review of Side Effects, I would watch Channing Tatum in any role, unless he plays a villain. What bugged me the most about this movie was Joey King, who was overly dramatic and towards the end very annoying. I am not sure if her character was just that way or if she should rather act in theater. If you are looking for a sophisticated movie with deep and smart plot stay away from it, but if you want an action jewel that keeps you at the edge of your seat go see it, it is definitely worth it. I think that White House down was better than Olympus has Fallen. I think that the concept of White House Down were more relevant and believable than Olympus has fallen. Pingback: White House Down VS. Olympus Has Fallen | Simon Says... WATCH THIS! Pingback: Olympus Has Fallen (2013) – A well- acted Action- Thriller that is lacking in Action and Zest | Simon Says... WATCH THIS!